Cut the baguette in half, then slice in half lengthwise. Brash the baguette with olive oil, put the bread onto a hot grilled pan over medium heat and toast until golden on both sides. 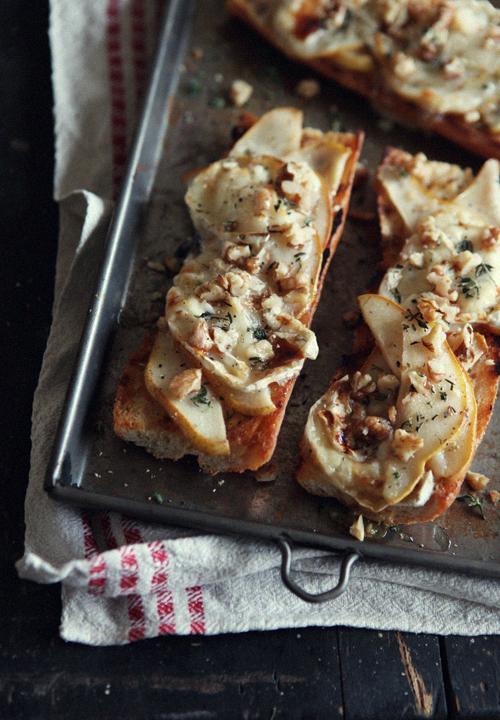 Transfer the toasts to a baking tray, arrange with the pear slices and goat’s cheese, sprinkle with the walnuts, thyme and black pepper, drizzle the honey over the top. Grill under the broiler until the cheese is lightly golden. You are currently reading Pear & Goat’s Cheese Toasts at Fish Trip Cafe.